Is light olive oil lower in calories than the regular kind? No. All oils contain between 120 and 130 calories per tablespoon. 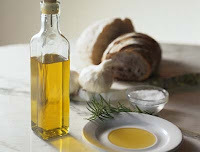 The term “light” in reference to olive oil indicates it has been heavily refined to remove its strong color and flavor. Light olive oil still has the same heart-healthy benefits as regular olive oil thanks to its high levels of monounsaturated fat, but it can be used for baking or to cook anything that might be ruined by strong olive taste. As an added bonus, light olive oil has a higher smoke point than regular olive oil, making it a better choice for high-heat cooking methods.